I hate winter for many reasons. But at the top of my list is dry skin. The second temperatures drop below 50, my skin reacts and becomes coarse, chapped, rough and raw. Even my feet begin to suffer, whether they're protected by my Uggs or slathered in the richest cream I can find. That is, until I discovered KenzoKi Barefeet Fantasy. I have never found another cream that works as well as this one. Ingredients like shea butter and cupuaçu butter soften, nourish and moisturize even the driest skin. It even has rice plant water, which enforces the anti-radical activity of antioxidants! My feet have literally never been smoother ... even my poor, tired, overworked toes are good as new! 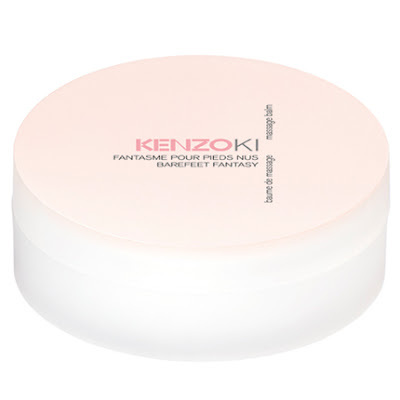 Kenzo refers to this product as a "massage balm" -- but I think it has the consistency of a cream. It's thick, rich, lush ... but with the consistency of whipped butter. And it smells amazing -- light and crisp with a floral edge. KenzoKi Barefeet Fantasy retails for $30 at kenzousa.com.